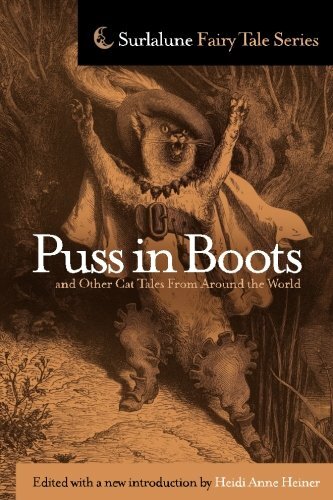 It's interesting how often cats pop up in folklore, I probably know more tales about cats than dogs. For example there's one cute short tale from Ludwig Bechstein in which an old woman nurses a sickly cat back to health, not even letting her children near it for fear they might treat it poorly. The next day the cat is gone, but after a few days when the woman walks by the same spot where she met the cat a noble woman (Bechstein assumed the Grimms' habit of never actually referring to fairies as fairies even if they are obviously fairies) gives her 5 knitting needles. The woman then, atypically for a Kind "Girl" is confused, because the gift seems too humble for such a rich woman, but doesnt say anything. In the evening she puts the needles down and the next morning there is a brand new pair of socks on the table and so it happns every morning whenever she puts the needles on the table. The unkind girl is missing from the story, but I feel that brevity is the appeal in this tale, so I don't miss her. I hadn't thought about the tales with bears being similar to Snow White and Rose Red! There was actually a different story I forgot to mention where the cat instructs the Kind Girl to ask the bear for dresses like the sun, moon, and stars, to keep him busy all night, so a strange connection to Donkeyskin too. And I kind of agree that the unkind girls aren't always needed-especially reading several similar tales in a row, I would skim over her part. Nothing was new except for the punishment, and it was obvious what she would or wouldn't do based on what the kind girl had already done.